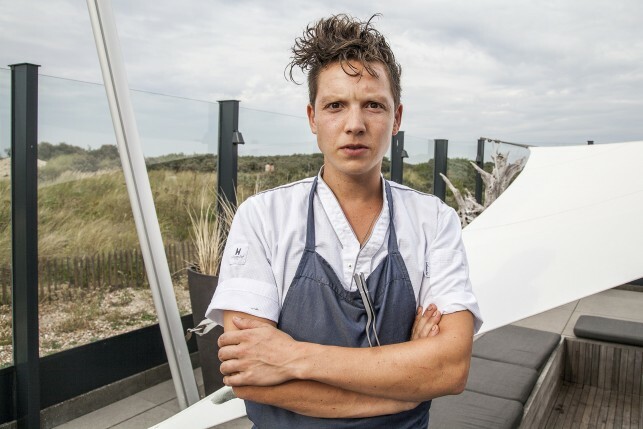 Resto Bar Pure C (1 * Michelin) is a concept from Sergio Herman (chef and owner of Oud Sluis) and is located at the beautiful beach of Cadzand in The Netherlands. The bar and restaurant are part of the hotel ‘Strandhotel’ which offers beautiful rooms with or without sea view. With Resto Bar Pure C, Sergio Herman wanted to create a dynamic concept that is easy accessible, offering good value for money and with a great holiday atmosphere. And indeed, when you enter through the doors of the restaurant, another world unfolds and the panoramic view on the North Sea, the beautiful interior, the uplifting music and the young and motivated staff get you in the right mood to lounge and enjoy great cocktails and amazing food. The interior is designed by the Belgian architect Lieven Musschoot and is impressive to say the least. White dominates the dining room, completed by natural wood, brown seats and blue pillows. Several round dining compartments are dotted around the dining room, some of them boasting a beautiful view on the dunes and the sea. Big and impressive light spheres with golden plates hang above the tables and give the restaurant an oriental twist. The sea, only a couple hundreds meters from the dining room, tops it off in style. 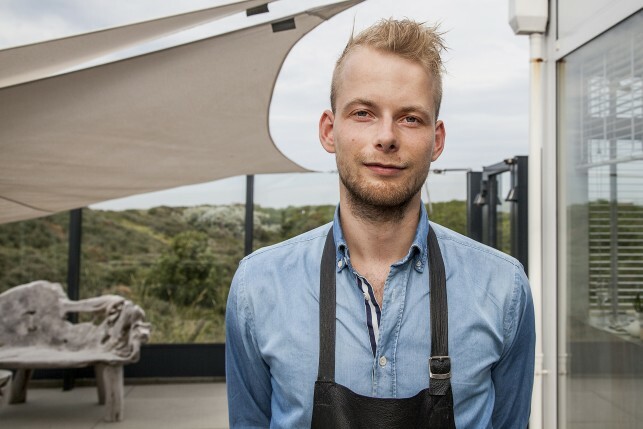 Sergio Herman appointed Syrco Bakker (Veghel, 1984) to lead the kitchen in Resto Bar Pure C. Previously working in restaurants like Gordon Ramsay, De Librije and – of course – Oud Sluis, Syrco is one of The Netherlands’ most promising chefs. It is truly impressive how Syrco Bakker knows to combine exceptional ingredients and serve them in the right portions, creating a perfect taste combination without letting one of the ingredients take the lead. When you watch the young chef cook and explain about his dishes, you know there’s a genius at work. Syrco isn’t the only genius in Pure C. The extremely motivated team is bursting with talent and it is a pleasure to see them do everything they can to make the guests relax and feel good. The Maître Huibrecht Berends skilfully manages the dining rooms and nothing is too much when it comes to serving the clients. Young, ultra motivated and extremely talented, Syrco Bakker offers a very interesting style of cooking: very fresh, pure but inventive, bringing an ode to Zeeland and incorporating exotic Indonesian accents. A very light type of kitchen with lots of acids, vegetables, fresh sea food and herbs. Some of the dishes are Oud Sluis classics, which offers a great opportunity to sample great Oud Sluis dishes at small prices. As in Oud Sluis, most of the dishes derive from a story that the chef wants to transmit to his customers and reveal dare, humour and passion. The price quality ratio is very impressive with the six course menu coming for 68€ and the eight course menu for 85€. The sommelier Maarten Buysse serves interesting international wines in style and with passion and surprises with his creative choices. An important part of Pure C’s philosophy and strength are the great cocktails. The bartender Paul Morel is one of the Benelux most talented cocktail mixers and serves creations like ‘Rose, shiso, hoisin and sour plum’, ‘Ras el hanout’, tomato, pomegranate’, ‘Grapefruit, fennel and champaign’ or ‘Wheatgrass, Pure C spices, tarragon’. They do sound like dishes, but these cocktails will surprise you with their balanced flavours and beautiful presentations. One would indeed travel to Resto Bar Pure C just to sample these incredible cocktails! Resto Bar Pure C is a bar & restaurant concept that is entirely future-proof and where quality is a philosophy for both food and drinks. The casual atmosphere, the great staff, the surprising food, the inventive cocktails, the incredible interior and the breath-taking views: there are just too much assets making this restaurant one of the most remarkable gastronomy spots in The Netherlands. Waw de nieuwe menu ziet er weer super uit! wow, dat ziet er allemaal zo ontzettend lekker uit! mooi interieur ook, love the photos! Leuk deze post te lezen! Heb voor volgende maand een arrangement geboekt daar en kijk er na het lezen van dit verslag alleen nog meer naar uit!